← The 1st Qtr. 2014 Central Headlight is arriving in your mailbox. 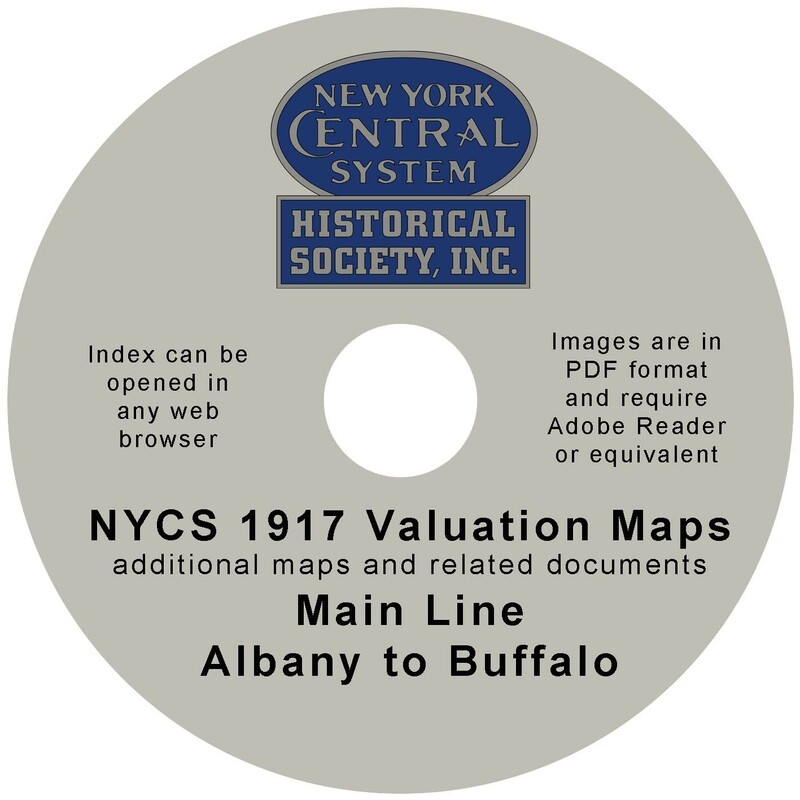 This DVD that is the second in the series of NYCSHS offered Valuation Maps contains milepost by milepost pdf images of valuation maps and related documents for the main lines of the Mohawk and Western divisions from the Hudson River to the shores of Lake Erie plus the line of the Niagara Branch. Valuation maps were created in 1917 by the New York Central Railroad to comply with the Valuation Act of 1913. The original maps were 24″ x 56″ covering one mile of right of way at a scale of 1″ = 100′. Although not complete additional right of way and land maps for the divisions from the NYCSHS Collection are included. To aid in understanding the railroad in the early twentieth century, an index of station names, USGS topographic maps from the period, as well as right of way profiles depicting gradient, curvature, and alignment are included. Adobe Reader tools assist navigation of images permitting the user to identify location of structures, right of way details, and location of yard and industry tracks found on the maps. The DVD provides an excellent resource for modelers and historians in understanding the New York Central mainline from Albany to Buffalo. Price for non-members $50.00 and $40.00 for NYCSHS members. Postage and shipping included. Ohio residents must pay 8% Ohio sales tax. Go to the NYCSHS “Collinwood Shop” to buy yours today. Click here for the DVD. This entry was posted in NYCentral Modeler, NYCSHS "Collinwood Shop" Your NYCSHS Hobby Store, NYCSHS News, Research Information. Bookmark the permalink.